If you are searching acupuncture for fertility in Dallas, you have come to the right place. Although you have heard good things about these alternative medicines, you still have questions about what to expect. You might even be a little skeptical. 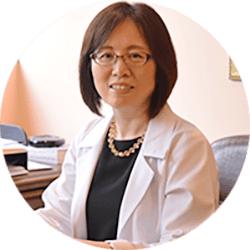 With extensive and successful experience using acupuncture to treat infertility, Dr. Zhou understands a great deal about her patients’ desires, aspirations and frustrations. Learn more about Dr. Zhou’s approach and the benefits you’ll reap from it. This information will help ease any concerns you might have and guide you down the path to improved health and fertility. Hormonal balance is essential for proper ovarian function and a healthy pregnancy. Studies have shown that acupuncture can normalize the secretion of hormones known to regulate a woman’s ovulation and fertility. These hormones include gonadotropin releasing hormone (GnRH), follicle stimulating hormone (FSH), luteinizing hormone (LH) and estradiol. Acupuncture influences the production and circulation of hormones in the body, regulates the communication between the brain and ovaries, and balances hormonal changes at different phases in a woman’s menstrual cycle. As a result, acupuncture can help regulate menstruation, improve ovarian function and even restore an egg’s ability to respond to hormonal cues. Acupuncture can significantly increase blood flow to the ovaries and the uterus. Many women who have had trouble getting pregnant have heard from their doctors that their eggs are unhealthy or unresponsive. Increased blood flow to the ovaries promotes good egg quality by supplying vital nutrients, oxygen and hormones to the ovaries. In turn, improving ovarian function and egg quality increases the likelihood of strong, healthy embryos. Increased blood flow to the uterus is also considered valuable in enhancing endometrial receptivity. This creates a thicker, healthier uterine lining and enhances embryo implantation and growth. Acupuncture is effective at reducing stress. Stress disturbs proper blood flow to a woman’s reproductive organs and interferes with hormonal balance. Overproduction of cortisol and adrenaline – two stress-related hormones – can inhibit the body’s effective use of estrogen, progesterone and testosterone. These are all hormones crucial to conception and implantation. According to the American Society of Reproductive Medicine, women who underwent acupuncture had reduced levels of stress hormones as compared to a control group of women who did not undergo acupuncture. Read about our “infertility stress and anxiety” site for more information. Dr. Zhou’s goal is to get your body into the best possible shape to overcome infertility and conceive naturally. She offers free initial phone consultations for her patients. Feel free to give us a call or email us. By demonstrating expertise and advanced knowledge in the fields of both Western and Oriental reproductive medicine, Dr. Lin Zhou became the first practitioner certified Fellow of the American Board of Oriental Reproductive Medicine (FABORM) in the Dallas-Ft.Worth Metroplex. She devotes most of her practice to the diagnosis and treatment of fertility issues. Her advanced training in this field qualifies her to provide an extremely high level of treatment. As a result, she has had a great deal of success in the field of infertility. Dr. Zhou prepares her patients for maximum success while they undergo in vitro fertilization (IVF) and intrauterine insemination (IUI). Compassion, empathy, care and understanding are integral parts of Dr. Zhou’s practice. To fulfill that mission, she offers an extensive, individualized personal evaluation, health care assessment and treatment plan on the first visit. During this visit, she also discusses general lifestyle concerns. Her goal is to help each and every patient regain their health and vitality – and, in the case of women with infertility issues, to offer treatment that will result in not only a successful pregnancy, but a healthy full-term baby!